Don’t you think it looks familiar? It’s Sophie Universe Blanket and I’m sure you have seen it before. This beautiful pattern creation shows how much you can do with a pattern by varying the colors and yarns. This beautiful blanket would be a masterful centerpiece of any bedroom, or simply a great cover to cozy up with on a cold winter’s evening. It’s just challenging enough to keep an advanced crocheter entertained, and just easy enough to get a beginner o up their game and advance in the craft. It’s one of this patterns everyone has to try Link to a free pattern is below. In these 2 projects The Crocodile Flower and The Enchanted Garden Tote were incorporated. 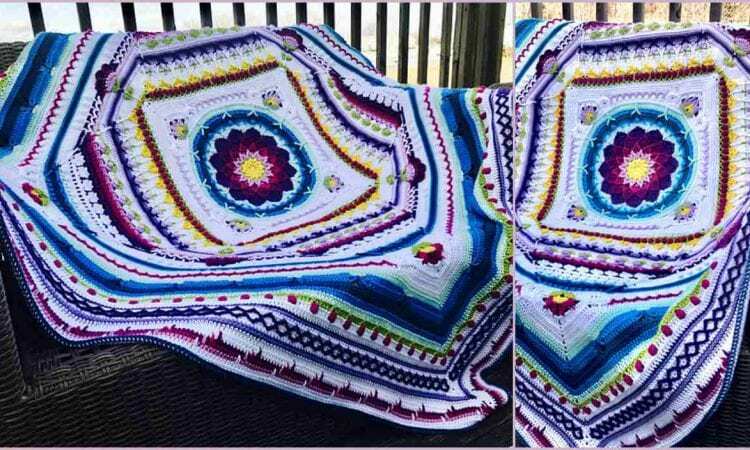 Sophie Universe Blanket – visit the free pattern site. or see more info about this projects: Project 1, Project 2, Project 3 and Project 4.